Hi, Durian! I am a runner/jogger, so for cycling routes, I would defer to Glam82 for his advice, and his suggested route is pretty scenic. I run/jog a pretty similar route on foot, usually between 14-15km, starting near the East Coast Seafood Centre / Lagoon (Actually now a Cable-ski park) and ending at Changi Beach Park. My run last week took the route in the map below (starting at the green marker, and ending at the red marker on the map). I start at Laguna Park, then head to the underpass under the ECP to the East Coast Park. This route starts near the East Coast Seafood Centre / Lagoon (This is the 1km mark on the map above). To start at that spot, either take a taxi to East Coast Seafood Centre, or take Bus 36 to Victoria School / the last stop before Changi Airport, and use the ECP underpass to get to the Seafood Centre/Lagoon. From that start point, I jog about 6+ km along the coastline along the East Coast Park track to NSRCC (National Service Resort and Country Club) and the Coastal Park Connector, at around the 6.5-7km mark, which brings you to the start of Changi Coastal Road at the 8km mark. There are a couple of points along this route which will bring you right under the approach path of aircraft landing on runway 02C. Then, you emerge from the vegetation of the Coastal Park Connector to the stretch of Changi Coastal Road alongside the runway (8km mark in the map above), it is 6km straight down the never-ending stretch of Coastal Road which parallels the entire runway 02C/20C and the whole Changi Airport terminal complex before hitting the Changi Ferry Terminal and the scenic and very windy Changi Beach Park from about the 14km mark. I find this route wonderful because, starting at the East Coast Lagoon, you run past the East Coast Park alongside beach goers, joggers, strollers and couples, past Bedok Jetty, towards the Sailing Club, OBS and National Service Resort & Country Club at the 6.5-7km mark, where it gets increasingly quiet and deserted, except for cyclists. 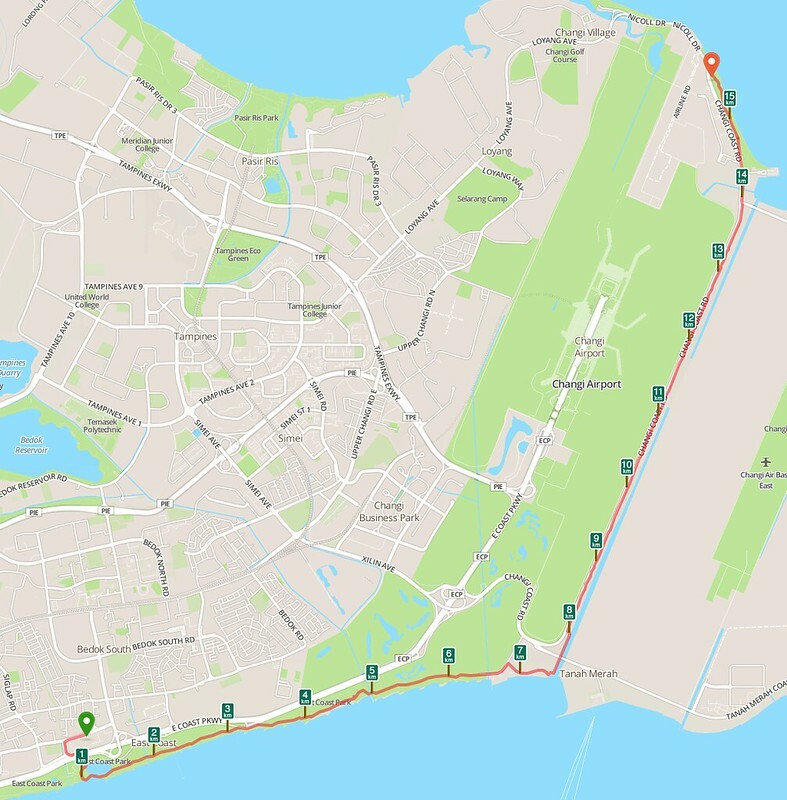 Then you hit the Coastal Park Connector, a very deserted and scenic trail by the sea, before you hit the reclaimed land and Coastal Park at the 8km mark, and then you have 6km of straight (but mostly shaded) track, where you can observe planes taking off and landing alongside, until the end of the Changi Airport complex, where you hit the Changi Ferry Terminal at the 14km mark, where there is a refreshment stand, toilet and the start of Changi Beach Park, which is a very windy and scenic trail to complete the final leg of your run. From that end point at Changi Beach park, you can either catch a bus or taxi (there are plenty there) to head home, or go several more km to Changi Village where there are many transport options available. This is the perfect 15-16km run for me. The other good run goes in the opposite direction, starting at the same spot, along the ECP and Tanjong Rhu but right to Marina Bay Sands and the CBD- a good 12km, but that is another topic for another thread . For a shorter run (say 8km), you could consider making your way NSRCC and start the run from there until Changi Beach park. I have never tried this route in the reverse direction (i.e. from Changi Village or Changi Point) but it should be feasible as well. On the map above, there are washrooms along East Coast Park at regular intervals until the 6.5km mark, then the next restroom and refreshment kiosk (There is a person selling cold drinks there) is at the 14km mark at the start of Changi Beach Park. The entire route is on a proper track, well lit and signposted, and mostly shaded by trees (although you would still be exposed to a lot of sun). There are many more cyclists than joggers/runners on this route. If you are into 10-15km runs, and don't mind stretches where you may be the only person on foot along the track (especially from the 8km mark till the 14km mark), I highly recommend this route! Hi Yflyer, thanks a ton for the super detailed directions. The route pictured is exactly the one I want to run this sunday. My main criteria is no car traffic (tough to achieve other than Mc Ritchie) and aircrafts ! Living and working in the west (of Singapore), I only go to EC park once a year, in the morning of the 1st sunday of December so the directions are very helpful.